Ponzano, November 16, 2011. Hatred is never appeased by hatred in this world. By non-hatred alone is hatred appeased (Quote from the Sutta Pitaka. The Basket of Suttas, Sutta Pitaka, contains over 10,000 suttas (teachings) of the Buddha or in some cases, his most authoritative disciples). This profound and humane concept of tolerance sums up the principles inspiring the UNHATE CAMPAIGN, which Benetton has created with the aim of contrasting the culture of hatred and promoting closeness between peoples, faiths, cultures, and the peaceful understanding of each other's motivations, using a global call to action and the latest communication tools. The worldwide communication campaign UNHATE, which is the first initiative by the newly-formed foundation of the same name, wias presented in a worldwide preview by Alessandro Benetton, Executive Deputy Chairman of Benetton Group, on Wednesday 16 November 2011 in Paris, at the flagship store in Boulevard Haussmann. ''While global love is still a utopia, albeit a worthy one, the invitation 'not to hate', to combat the 'culture of hatred', is an ambitious but realistic objective. 'At this moment in history, so full of major upheavals and equally large hopes, we have decided, through this campaign, to give widespread visibility to an ideal notion of tolerance and invite the citizens of every country to reflect on how hatred arises particularly from fear of 'the other’ and of what is unfamiliar to us. Ours is a universal campaign, using instruments such as the internet, the world of social media, and artistic imagination, and it is unique, in that it calls the citizens of the world to action. At the same time, it fits perfectly with the values and history of Benetton, which chooses social issues and actively promotes humanitarian causes that could not otherwise have been communicated on a global scale, and in doing so has given a sense and a value to its brand, building a lasting dialogue with the people of the world.'' Alessandro Benetton. The UNHATE communication project includes a series of coordinated initiatives and events, starting on 16 November 2011 in the main newspapers, periodicals and websites around the world. 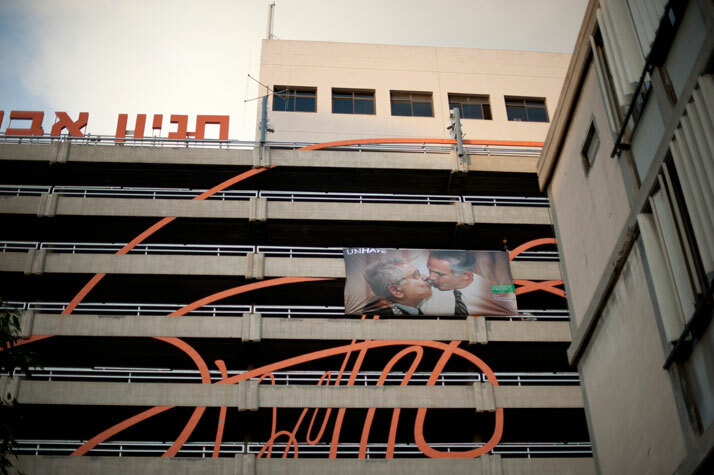 The central theme is the kiss, the most universal symbol of love, between world political and religious leaders, such as: Barack Obama and Chinese leader Hu Jintao; Pope Benedict XVI and Ahmed Mohamed el-Tayeb, Imam of the Al-Azhar mosque in Cairo (the most important and moderate centre for Sunni Islamic studies in the world); the Palestinian president Mahmoud Abbas and the Israeli prime minister Benjamin Netanyahu. These are symbolic images of reconciliation - with a touch of ironic hope and constructive provocation - to stimulate reflection on how politics, faith and ideas, even when they are divergent and mutually opposed, must still lead to dialogue and mediation. The film UNHATE by French director Laurent Chanez, tells of the precarious balance and complex interweaving between the drive to hate and the reasons to love. It is built on a crescendo of deliberately ambiguous images: eyes flirting or glowering, people embracing or fighting, insurrections or celebrations, brawls or wild dancing. Extreme moments of conflict or love: two fighters after a round, a couple who have just made love … or perhaps this too was a battle. The new campaign, the creation of the Foundation and the other initiatives of the UNHATE project reflect Benetton's wish to drive the desire for participation and change that animates the world's citizens, and especially the young, inviting them to play an active, central role in its initiatives, particularly through the internet, social media and other digital applications. 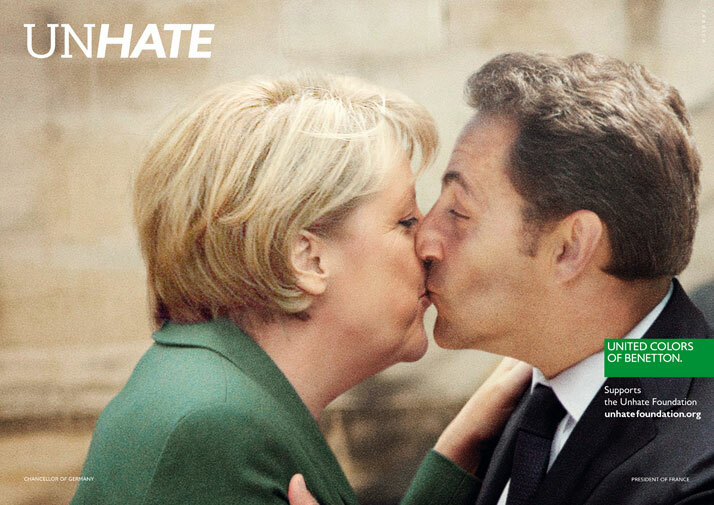 This marks a further step forward in Benetton's communications, which elicit intervention and action from everybody, in the name of an ''expanded'', open democracy, without physical, political, social or ideological boundaries. The UNHATE Foundation, desired and founded by the Benetton Group, seeks to contribute to the creation of a new culture of tolerance, to combat hatred, building on Benetton’s underpinning values. It is another important step in the group's social responsibility strategy: not a cosmetic exercise, but a contribution that will have a real impact on the international community, especially through the vehicle of communication, which can reach social players in different areas. The Foundation will organise initiatives involving different stakeholders, from the new generations to the institutions, international organisations and NGOs, right through to civil society. The Foundation also aims to be a think tank, attracting personalities and talents from the fields of culture, economy, law and politics, and people who have gone from simple citizens to leaders of movements, distinguishing themselves through their ideas and actions against the causes and effects of hatred. 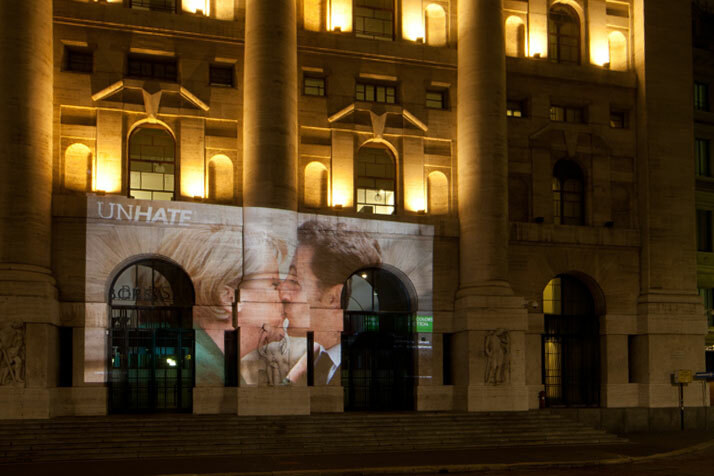 In line with the spirit of active participation and concrete action that drives the UNHATE project, the pictures of the United Colors of Benetton campaign are central to a billposting operation: a plan of unannounced live actions. 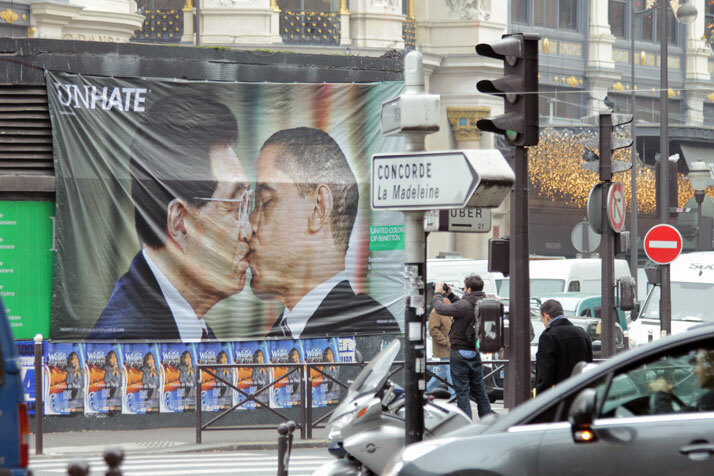 Groups of young people will post the manifestos showing kissing leaders on the walls of locations symbolic of the desperately-needed peace process: Tel Aviv, New York, Rome, Milan, Paris. 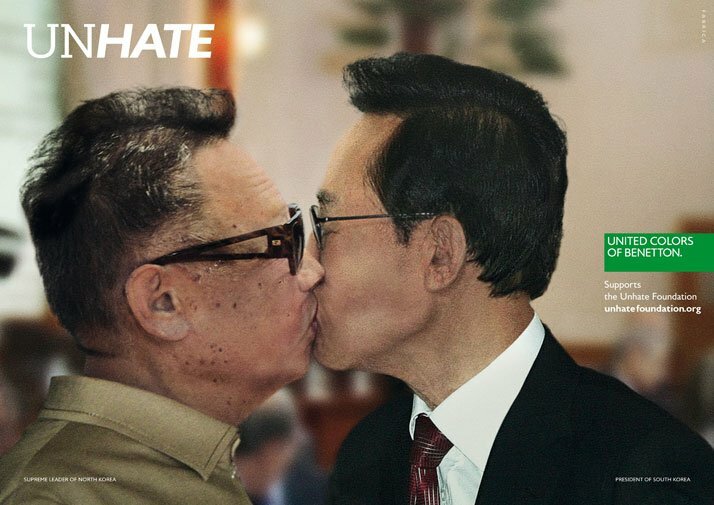 The UNHATE Foundation website brings together all the images from the United Colors of Benetton campaign and the various events, such as shots of the live actions in the world's hot spots. The photos and videos will go to make up a vast programme available online. 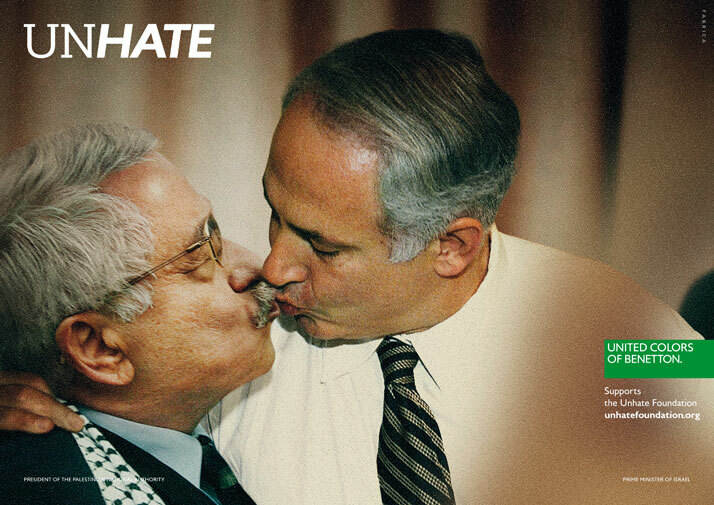 On the UNHATE website there are also two ad hoc applications: UNHATE KISS WALL, which randomly chooses the pictures uploaded to the site by individuals, and unites them in a passionate kiss (a new kiss each time). And UNHATE LIST, a Twitter-based list of the things and people that are not hated, which is constantly updated by visitors. The idea of tolerance in the United Colors of Benetton campaign will find further scope for application, equally tangible and symbolic, in the creation of an art installation, made using the empty bullet shells sent in by the inhabitants of war zones around the world. Fabrica's Cuban artist Erik Ravelo, who is also the creator of the Lana Sutra series of sculptures, will recycle this ''war waste'' to build a beautiful big dove of peace, UNHATE DOVE, four metres long, which will carry with it the Foundation's message of peace.